A few months ago, I went on a rafting and fishing trip in the Alaska back-country with a few of my Air Force buddies. A float plane dropped 6 of us off about 60 miles south of Denali (formerly Mt McKinley) at the top lake in the river chain where the salmon are swimming to spawn. It was some kind of beautiful! We had a great time catching fish, camping off the grid, and rafting in class 4 rapids (after a rainstorm with no cell phone service). It was remote to say the least. One of the big risks on the trip (outside of drowning in the rapids) was a grizzly bear attack. Before we left, the outfitter explained what we should do if we encountered a bear. We all rehearsed this encounter in our heads and then took every precaution to make sure it didn’t happen. Preparation is what helps us avoid acting on instincts; suppressing the urge to flee would require a big conscious effort. Imagine fishing down the shoreline of a beautiful crystal-clear river where the bushes grow right to the edge of the river (because they have never been trimmed). As you fish around the bend, you walk right up on a mother grizzly and her cub. In less than a second, the bear storms toward you at 30 miles an hour. Every bone in your body and your DNA says run, but the statistics show that is the worst thing you could do. Instead, the outfitter coached you to stand your ground, get big, and make noise. Luckily, we didn’t have that encounter, but we all discussed it and were ready should it happen. Nowhere is this example more relevant than when a fierce bear market shows up when investing in the financial markets. The natural tendency is the feeling of fear which often leads to investors saying to themselves, “I should just sell my investments and run to the sidelines to get out. Then once it’s over I can get back in”. The problem is, this strategy rarely works well. Research has shown that most moves based on emotion end up hurting long-term returns. This is because of the effects they have on taxes, the difficulty of deciding when to get back in (you have to be right twice), and the fact that many of the best investing days typically follow directly after the worst, etc. I think with the recent market volatility we are reminded that markets can’t rise forever. Now is the time to prepare for how you will respond to the day you wake up and find the bear charging. (And no a 1,000 point move in the DOW is no longer a bear market. And no matter how spun up the media gets, a 1,000-point decline 1,000/25,700 = 3.89% is hardly worth getting excited about.) By definition, a bear market is a 20% drop (now about a 5,140-point decline) in the DOW Jones Industrial Average. Boy would that would get the media excited! Can you imagine what the headlines would read if we had a 1987 type of day – a one day decline of about 5,000 points? I don’t pretend to know when a decline will occur, I just know that one day it will. As an advisor, I want to make sure you are comfortable with what you will do when this event eventually unfolds. Because I can promise you we will continue to execute our strategy, re-balancing your portfolio as our thresholds are breached. I think the US economy is still on solid footing despite fears from rising rates, the effect of tariffs, and higher oil prices. It took a while to get the US economic engine going. Now that it is going, the benefits of the tax cuts, low inflation, and full employment should keep the US economy on solid footing and plowing forward even in the face of higher valuations. I think there is more risk to being out of the market than being in it. Currently most of our equity models are at about a 50% weighting to the United States which is our neutral position. Follow this link to look at how each class has performed. Rising Rates: Rates have risen. This is evident with the 10-year Treasury yield moving decisively above the 3% mark recently. Rates are still low by historical levels, but a continued move higher would cause us more concern. Looking at our portfolios, you will notice that we are currently taking very little interest rate risk. Our portfolio “duration” (how long until the bonds we own will be repaid) is currently on average less than 5 years, in most models. For the past several years we have owned a floating rate bond fund, a short-term bond fund, and several different intermediate term bond funds (these keep duration between 5-7 years) that have been positioned at the shorter end of the spectrum. As rates rise closer to the returns needed to help our clients achieve their targeted return objectives, we will extend maturities if that increases our chances of achieving the desired goals. For instance, if a retiree needs a 6% effective return to meet their goal, as rates approach 4-5% we will begin to move out on the yield curve farther than we have recently been in a period of rising rates. Emerging Markets: Emerging Markets were the biggest loser for the quarter. 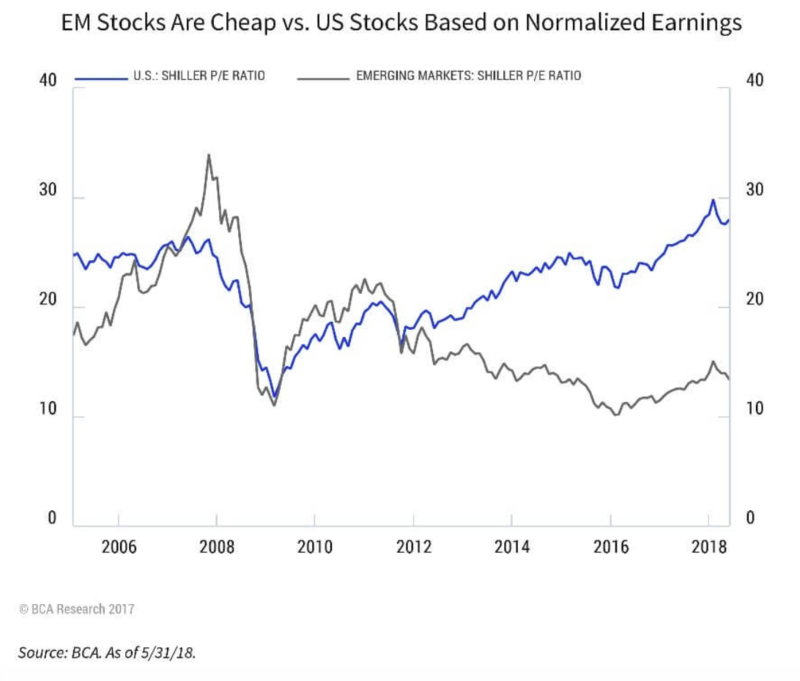 Because we like the markets that are less liquid, the more Emerging under-performs the US the better the long-term value investors will likely receive from owning it. As we have said in the past, we still believe Emerging Markets will likely provide investors the best results of the major asset categories long-term. Look at Figure 1 below to get an idea how relatively inexpensive a dollar of earnings is in emerging economies compared to the US. According to Capital Economics, foreign exchange reserves in the Emerging Markets are, in aggregate, about the same size as their external debts. Contrast this with the fact that they were only about 30% of the size of external debts in the late 1990s (the last time Emerging Markets were this cheap). This means Emerging Market countries now have better debt coverage. At the aggregate country level, most emerging country debt is in local-currency terms and most Emerging Market countries now have floating rather than dollar-pegged currencies which helps release pressure in their economies (i.e. it lowers the likelihood of sharp currency declines that result in deep and sudden crises, as happened in the 1980s and 1990s). Figure 1 above shows the past 12-year price to equity (PE) in the United States and Emerging Markets. Since peaking in 2007, Emerging Markets PE hasn’t been above 25. The Unites State PE currently sits around 30, while Emerging Markets is just above 12. We’d therefore argue Emerging Markets are fundamentally better placed today than in past cycles. P/E is only one form of valuation, but I think the point is that over time the valuation you buy at combined with the cost are two factors that will have a large impact on total returns over an investment cycle. I wanted to briefly talk about MWA’s rebalancing policy and why it’s important to your long-term returns. 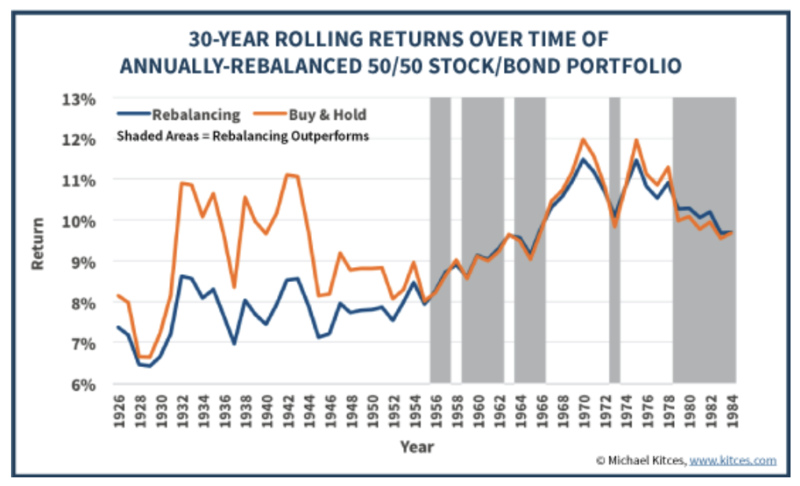 As you can see from the picture below, rebalancing will hurt returns when markets rise and add to returns when markets fall. At MWA we rebalance taxable money different from tax deferred money. For taxable money we allow the constraints to be set wider than for tax deferred, so that we are not constantly generating trades which could cause taxes (we don’t have to worry about taxes in tax deferred accounts). We look at all assets and the portfolio models daily. We run trades quarterly, unless there is a large intra-quarter move (if there is a threshold violation that would cause a trade because tolerance bands are violated). For taxable accounts, we use broader based thresholds and a 3-year time-based overlay. Ideally, we use money movements from dividends, interest, contributions, or withdrawals to continually rebalance the portfolio to their asset class targets. The goal of our rebalancing policy is to capture large, meaningful, opportunistic rebalancing trades that are worth more than their cost. They typically occur when two assets move up or down at different times. The idea is to generate a trade when either asset has a big move up or down before they snap back together. If the assets rise and fall at the same time, no trade will be generated. There have been many studies on this topic and our approach attempts to incorporate this research to produce the most long-term benefits. Section IV: Client Question am I Underperforming? For the last 4 ½ months we have been implementing a large enterprise software program (Black Diamond) that will completely redefine how we report, manage, and trade accounts (inside and outside of Mills Wealth). We believe the Black Diamond software will improve how we communicate and what we are able to show you. By using an account aggregation software (Quovo), we will be able to bring 401k balances, different kinds of debt, and other held away accounts into your net worth sheet in Black Diamond that dynamically update and feed this data to their mobile app, a new and improved investor portal, and our Financial Planning Software. The new Black Diamond software is replacing Portfolio Center, a reporting and trading software owned by Schwab. We have been planning this transition for well over a year, and after deciding on one of the best in class software programs, we pulled the trigger and have been reconciling 1,000 accounts spread over 15+ years. I wish I could tell you it was easy. It has been slower than we hoped, but we are making good progress and anticipate you will be able to use it by year end. At its simplest form any account that has an internet login should be able to be consolidated through the Quovo aggregation software. The new software will allow us to be much more proactive with monitoring outside assets that are normally difficult for us to see except at reviews. We are in the processing of testing outside assets and the problems we may face as we bring them into our system. Sadly, many outside asset feeds are not as clean as the major custodian feeds like Schwab, Fidelity, and TD Ameritrade, so we have been working through problems and solutions. Based on feedback we have gotten in the past; most clients would like a consolidated financial statement no matter where the asset is located. The software will also come with a new interactive portal, and an app for your phone. We expect to be able to store all your net-worth data in this software along with your estate documents and contracts you have signed with us or our providers. Much of which should be able to feed your bank’s financial statement without having to go pull all those values manually. If you want to be an earlier adopter, please let us know and we can bring in your outside assets and we will gladly take your feedback on the look and design of the various reports and views we are playing with. Thanks again for trusting us with your hard-earned assets, should you have any questions or concerns please give us a call. With the new tax code changes, it might be worth looking at your situation to see if we should execute on any strategies before year end.